AUGUST IS UPON US, WHICH MEANS NATIONAL SANDWICH MONTH IS HERE! I ABSOLUTELY ADORE SANDWICHES, AND WILL BE BRINGING YOU RECIPES FOR MANY DELICIOUS VERSIONS AS THE MONTH GOES ON. STICK AROUND, IT’S SANDWICH TIME! Everyone has those hometown restaurants that they miss, and one that I miss from back home was a little Greek quick-service place called Fronimo’s. There’s something about Greek fast food that is so comforting, usually because it comes with a big pile of crispy french fries with lots of ketchup! My standard order at that little Greek place was the chicken sharwarma in a pita,with plenty of lettuce, tomato, onion, and tzatziki sauce, but I would occasionally go for the falafel pita. There’s just something so good about falafel — crispy vegan patties made with chickpeas, onion, garlic, parsley, and spices, deep fried until crunchy on the outside and soft on the inside… Mmm! Somehow, I never really thought I could make falafel at home. It seemed somehow beyond my capabilities, but that’s just because I didn’t realize how dead-simple it is to make! The most difficult thing about homemade falafel is the time that goes into it. The good thing is, it’s mostly inactive time, so if you have a chill weekend, go ahead and throw together this super simple and amazingly good falafel! Pile it up in a soft pita pocket with lettuce, tomato, onion, and tzatziki. Tahini sauce is more common, but I find that the cool, light flavor of tzatziki sauce goes very well with the crispy falafel patties. For the falafel: Place the dry chickpeas in a large bowl and cover them with water, so that they’re fully submerged by a few inches. 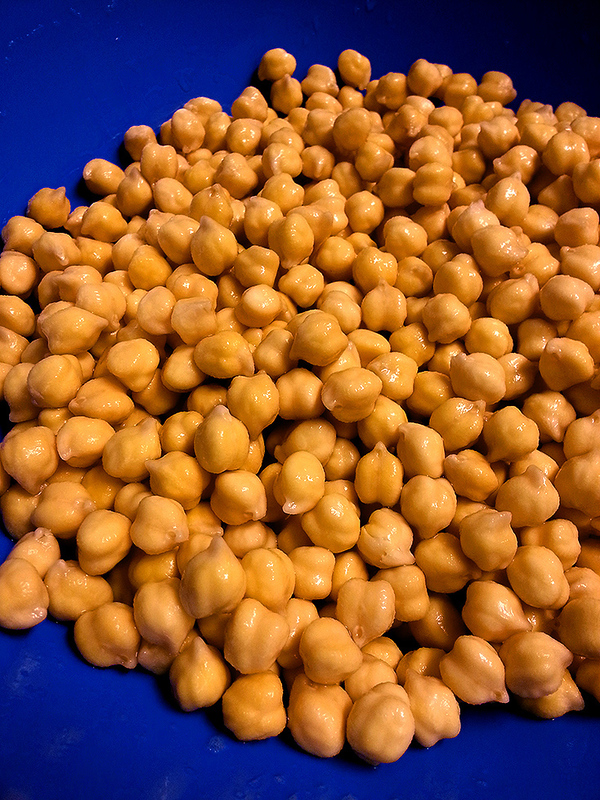 Let the chickpeas sit uncovered at room temperature for 24 hours. Check the level of water about halfway through, and if they are absorbing so much as to be above the water, add a bit more water so they’re covered again. After the time is up, drain the chickpeas. To the bowl of chickpeas, add the chopped onion, parsley, garlic, flour, salt, cumin, coriander, pepper, and cayenne. Stir to combine, and put half the mixture into a large-capacity food processor. Pulse the processor until the falafel mixture is the texture of couscous, about 65-70 pulses, scraping down the sides periodically. The mixture should not become a paste, but should still be a little bit coarse. Dump the processed falafel mixture into a separate bowl and process the second batch the same as the first. Stir the two batches together to make sure everything is well mixed. Cover the bowl with plastic wrap and let chill for 1 1/2 hours. Once the falafel has chilled, heat several inches of oil in a 6 quart pot or a countertop deep fryer to a temperature of 360 degrees. Portion the falafel mixture into portions about 3 tablespoons each (or use a #30 scoop) and carefully place them on a plate. Be careful, they’re prone to crumbling so handle them gently! Flatten the portions to form thick patties. Drop a few at a time into the hot oil and cook for 4 minutes total if fully submerged in the oil, or 2 minutes per side if you have to flip them over. Drain the freshly fried falafel on a paper towel-lined sheet pan and sprinkle with a bit more salt as soon as they come out of the fryer. Continue frying the falafel patties until all the mixture has been used. Eat the falafel immediately, or refrigerate up to 5 days. If you want to keep them longer, just let the falafel cool and place them in zip-top bags in the freezer for several weeks. To reheat from frozen, wrap in a damp paper towel and microwave until heated through. To assemble the falafel sandwiches: Cut a pita in half so you have two pockets. Fill each pocket with some sliced tomatoes and a handful of chopped lettuce. Spoon some tzatziki or tahini sauce on top of the lettuce and top with 3 falafel patties. Tuck a few pieces of raw onion around the falafel, and top the falafel with a bit more tzatziki or tahini and some crumbled feta cheese. Serve these falafel pitas along side some crinkle cut fries with plenty of ketchup for dipping, for that authentic Greek fast food experience. Yum!